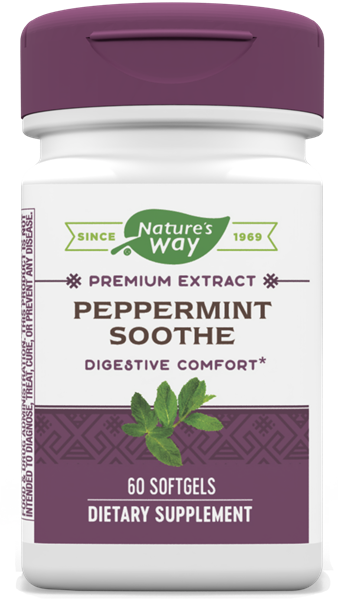 Peppermint Plus® / 60 softgels - Nature's Way®. What are the milligram (mg) equivalents of the milliliter (mL) quantities of peppermint, rosemary, and thyme oils found in Peppermint Soothe? Each enteric-coated softgel of Peppermint Soothe contains 0.2 mL of peppermint oil, 0.02 mL or rosemary oil, and 0.02 mL or thyme oil. Using the conversion factors provided by our research scientist, this equates to 181 mg of peppermint oil, 16 mg of rosemary oil, and 16 mg of thyme oil in each softgel of Peppermint Soothe.